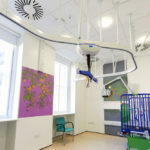 Built environment and estates consultancy Essentia Trading Ltd (ETL) has completed a complex refurbishment project to create a specialist unit for children requiring long-term ventilation care at Evelina Children’s Hospital in London. Snow Leopard ward provides 11 highly specialised patient bed spaces. It caters to the needs of patients who, once stabilised, need a transition space that allows them and their families to lead as normal a life as possible before a transfer back home. Midway through the Snow Leopard project, the clinical team also asked ETL to work on a new Children’s Ambulatory Unit called Snow Fox, a clinical facility with 19 clinical spaces. Snow Fox meets the demand for increased paediatric capacity, particularly during winter pressures. ETL’s expert team provided project management for both projects from start to finish, managing contracts and relationships with the client. It worked closely with clinicians and nurses to ensure that the ward met the requirements of staff and patients. It was also responsible for managing a strong design team and contractor procurement process and supervising the main contractor. The reconfiguration of space within the original St Thomas’ Hospital, dating back to the 1860s, presented many challenges, which were successfully navigated. The refurbishments also took place within busy clinical areas, which meant that the project had to be carried out sensitively with minimal disruption to existing services. This meant that planning and engagement between the clinical teams and contractors was key. On both projects, ETL facilitated a collaborative approach to the integration of art into the spaces creating a unique patient experience. Dan Humphries, Senior Project Manager at Essentia, commented: “The impact of these high-quality spaces on patient care cannot be over-estimated. Snow Fox has the capacity to care for an additional 250 paediatric patients each week, relieving significant pressure on clinical services as well as caring for children.